Pull out your bell bottoms and peasant shirts, you guys, because today we’re going retro. Like, super retro. Like, pulling out your loaf pan, smashing veggies and lentils into it, and calling it dinner retro. It’s Veggie Lentil Loaf time! What could seriously be more granola vegan than lentils, nuts, and vegetables in loaf form? It’s the stuff that my mom assumed I ate tons of–that and sprouts–back in my vegan days, but folks forget that a veggie loaf can be a world of tasty good. Take this simple, no-frills loaf Jenna of Eat, Live, Run posted back in 2010 (which, randomly, was the last year I made a veg loaf in…strange). There’s nothing fancy or weird in the ingredient list–lentils, walnuts, carrots–but something in the combination serves up a delicious, savory loaf that I bet even my mother would go for. Perfect with some sides of collard greens and smashed green beans and potatoes (recipe coming tomorrow! ), this loaf ushered in our first cool day of autumn with a hearty bang. It’s such a success that I think I might put it (and any variations) into my weekly rotation! In a small bowl, whisk the ground flax seed into the water. Set aside in the fridge. In a sauce pot, simmer the lentils, broth and a pinch of salt for about 25 minutes or until the lentils are tender and have absorbed all the broth. Meanwhile, prepare your veggies. Chop the onion, grate the carrot and dice the celery. Saute the onion, celery, and carrot in the olive oil over medium high heat for six minutes, or until tender. Add the garlic, oregano, salt, and pepper and cook for 1 minute. Remove from heat and transfer to a large bowl. In a small skillet, toast the walnuts (no oil) over medium heat (3-4 minutes). Remove from heat and transfer to the bowl with the vegetables. Add the breadcrumbs, flax/water, and cooked lentils to the bowl and mix to combine. Press mixture into a greased loaf pan. In another small bowl combine the ketchup (or tomato paste), maple syrup and vinegar. Spread on top of loaf. Bake for 40-50 minutes, until the top begins to brown and the edges pull away from the sides of the pan. Let cool for 10 minutes, then flip onto a plate and serve. OH MY GOSH, I’M DROOLING. this looks so delicious and the texture looks awesome! That looks so good! And perfect for this time of year. Maybe with some roasted butternut squash . . . Yes please! Now I’m having visions of lentil loaf sandwiches with extra ketchup…or maybe some sriracha? I love this type of dish! 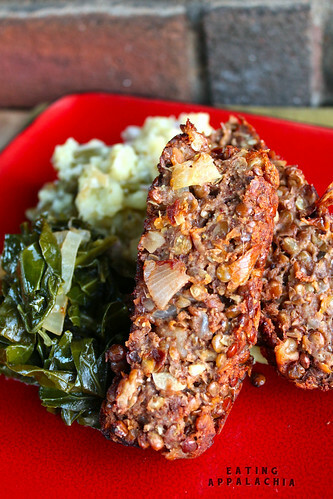 A no-nonsense, chunky lentil loaf that is not trying to be a mock meat. I love it! I think you missed an opportunity here to serve some kind of jelled dessert. For reals though, I love a lentil loaf, and yours looks awesome! How funny, I just had a big ol’ slice of lentil loaf for dinner. Mashed potatoes and green beans instead of collards.